I first discovered Goji berries several years ago when I was researching healthy Superfoods to feed to my children. I have been very open that my daughter has severe asthma and skin issues and originally learned about the health benefits Goji berries from her pediatric pulmonologist who suggested that she eat the berries and even drink the juice each day. My family and I really enjoy these delicious and exotic tasting berries that are grown in the Himalayan Mountains. There are fascinating studies and research that show how Goji berries are an excellent way to eat healthier and even possibly boost the immune system. Goji Gourmet has lots of fantastic information to read if you would like to learn more about these delicious Superfood berries. Suffice it to say that I was extremely excited to discover Goji Gourmet and their variety of Goji cookies. When the Goji Gourmet cookies arrived, I am not ashamed to admit that I bribed my children to clean their rooms if they wanted to “help” me with my review. They willingly complied and we all settled in to give it a taste. What can I say but……..it was absolutely delicious! Goji Gourmet uses only the highest quality ingredients including almonds, oats, oranges, ginger, honey and walnuts. The cookies are all natural, no added refined sugars, low calorie and they use as many organic ingredients as possible. 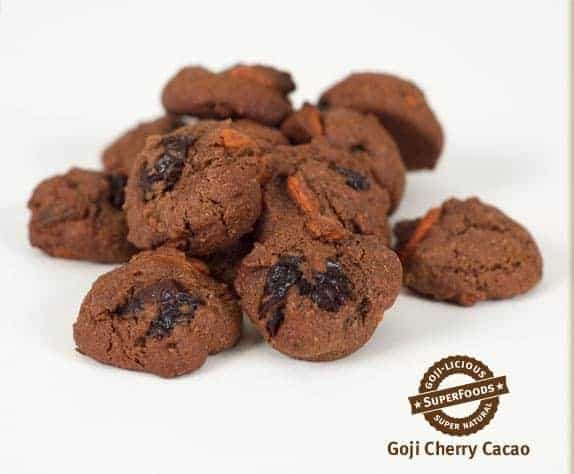 Goji Gourmet has several delicious choices if you would like to purchase their cookies including Goji Almond Oat, Goji Cherry Cacao (my favorite), Goji Ginger Walnut and Goji Orange Mint Chip. You even have the option to choice a Variety pack if you can’t make up your mind or may I recommend the “All Five Flavors” pack since I am confident you will just love these cookies as much as we do. To place your order or view the other fine Goji products at Goji Gourmet you are invited to visit their website. The Cherry Cacao cookies look very good. I would like to try the Goji 100 Juice. I signed up for the Goji Gourmet newsletter. I voted for Simply Stacie on Picket Fence Blog. 85 hour burn time. I love a good candle. I wanna try the ginger oat. I would like to try the Total Goji 100 Raw Juice. I’d like to try the Total Goji 100 Raw Juice, sounds so healthy! Likes Goji Gourmet on Facebook.